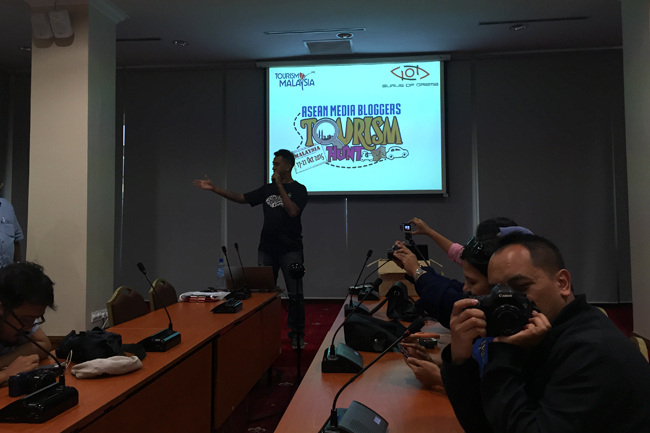 Hello and welcome to Day 2 of my Malaysia Mega Fam/Malaysia Tourism Hunt 2015 travel experience and photo diary. ***To know more about the treasure hunt click HERE. 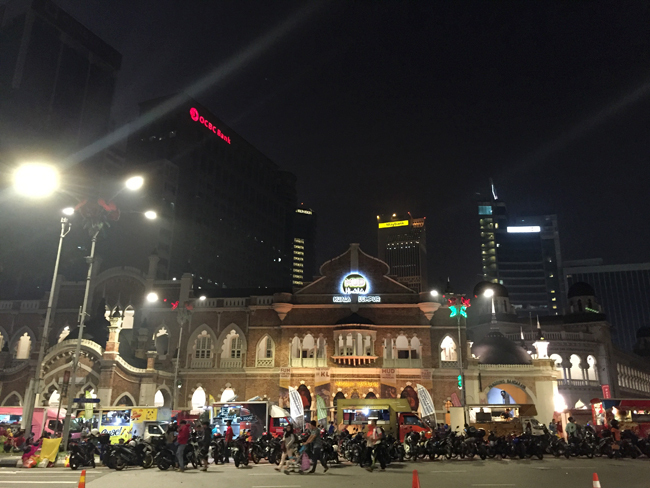 So just a quick recap before I continue...the Malaysian Tourism Hunt 2015 was designed as a friendly race from Kuala Lumpur to Malacca so we could familiarize ourselves with different tourist spots along the way and share with our readers. 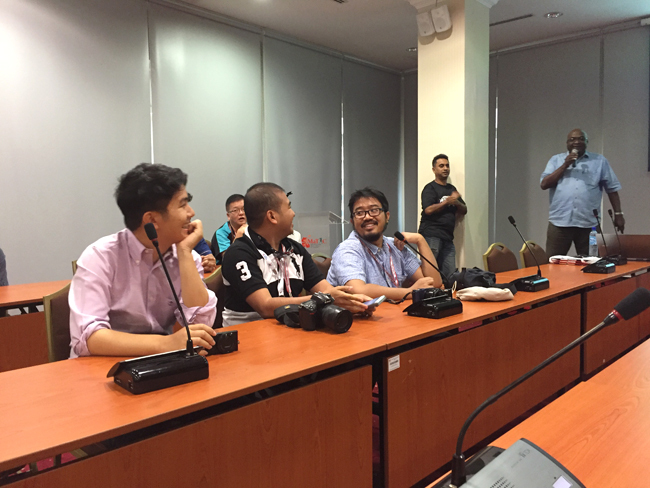 But before we could begin our journey, we needed to be briefed about safety driving rules and regulations in Malaysia, the cars we were going to drive and navigation materials. 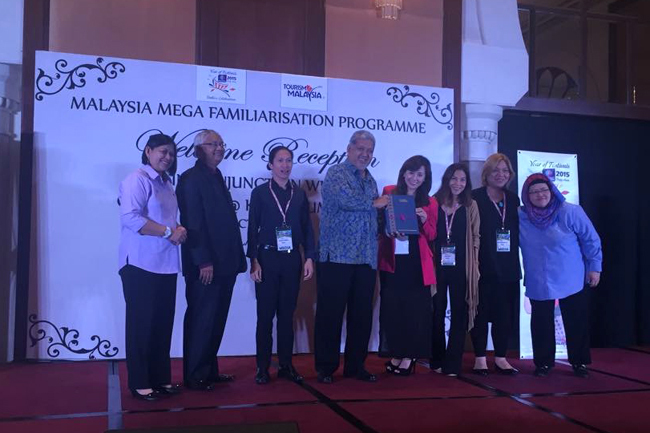 Our day started with a destination seminar, lunch and presentation of Certificates of Participation for all media representatives at the Sheraton Imperial Hotel in Kuala Lumpur. 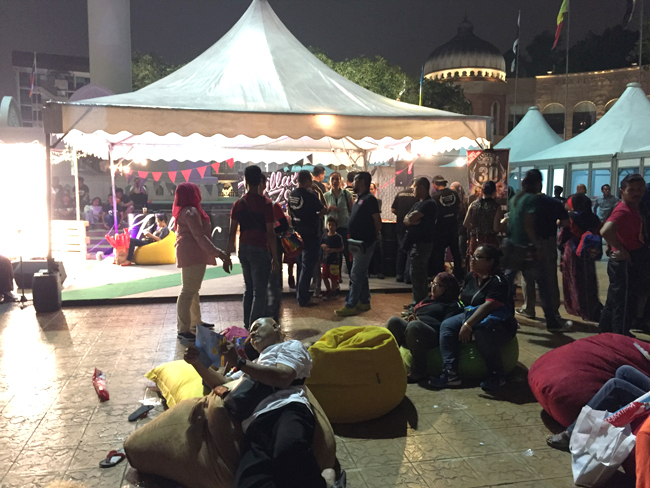 We were also given a quick sneak preview of Malaysia's rich culture via small booths set up along the hallway. 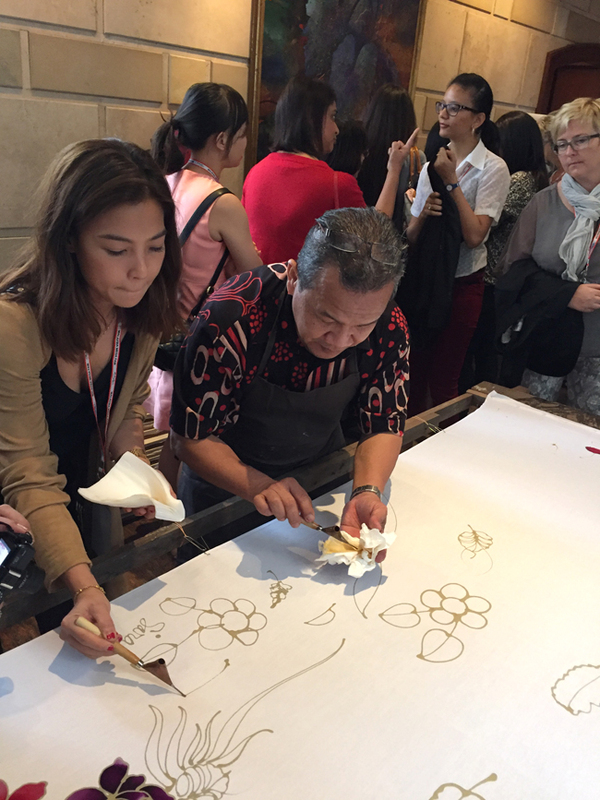 My favorite was learning how to do traditional batik. There is something about the art that I find really calming and centering. The designs are drawn in one single fluid movement using hot wax on cloth which you later brush with plain water and then a thin film of paint for a watercolor-ish effect. After a sumptuous lunch at the hotel, it was time to head to MATIC (Malaysia Tourism Center) for our car assignments and race briefing (which I badly needed because right hand drive! omg). Meet Sean, probably the coolest organizer I have ever encountered. He was hilarious off the bat and really did a great job of making us feel comfortable enough to act like ourselves and (most importantly) to ask all the questions we needed answers to concerning the drive no matter how far out or stupid they might have sounded to others. 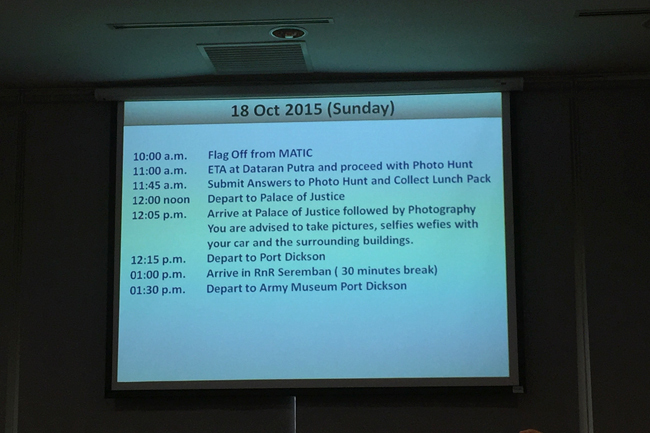 He explained that we were to drive off Matic the following morning at 10am and head straight towards our first challenge at Dataran Putra on our way to the next at the Army Museum in Port Dickson. 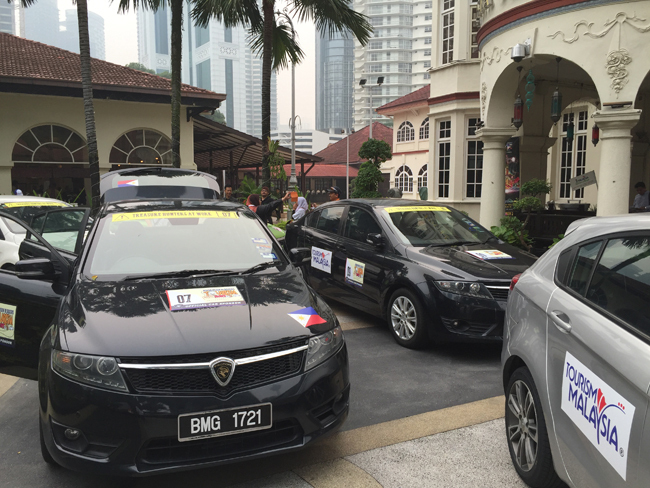 All countries were split into 2 teams and were assigned different vehicles sponsored by Proton Cars. So there was Team A Philippines consisting of myself (the driver) and Jared Baliguat of The Running Suplado (as navigator) in car #7. And Team B Philippines with Rochelle Rivera of RochelleRivera.com (as driver) and Jude Balasco from traditional media in Cebu as navigator in car #17. Everyone was assigned different car models and I was so happy that I landed a Proton Suprima S.
It was a great car that handled turns beautifully even at maximum speeds of 120km/hour. The ride was very smooth and comfortable too. 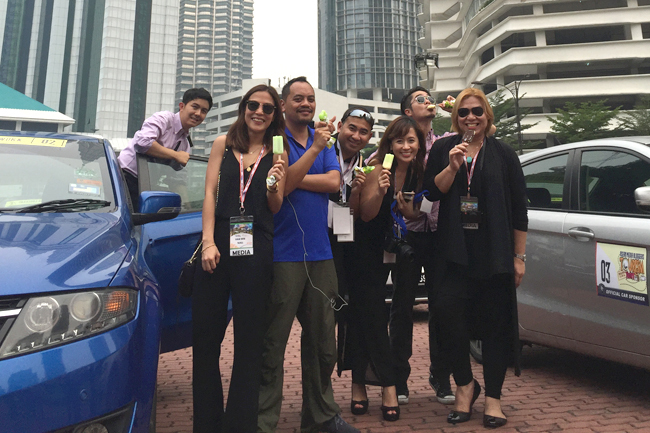 After affixing the official Malaysia Tourism Hunt stickers on our cars, it was time for a popsicle break under the scorching sun. A big favorite of ours were these lime pops found on the streets for only 2 ringgit*. So refreshing! Once we were done with all that, it was time to head back to the hotel and freshen up for dinner and the Citrawarna Festival! But first, I needed to have some more money changed cause I finished it all during my visit to Central Market. My partner needed some extra dough too so off we went on a quick money run to KLCC and here we are goofing off in the middle of the street (and I'm carrying one of the bags I bought at Central Market the previous day for only P300++). 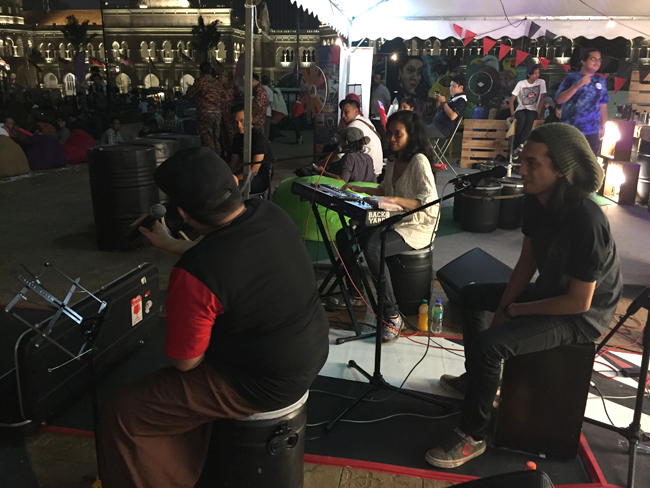 After another ride on our tour bus, we arrived at Merdeka Square, Kuala Lumpur for the annual CITRAWARNA FESTIVAL!!! 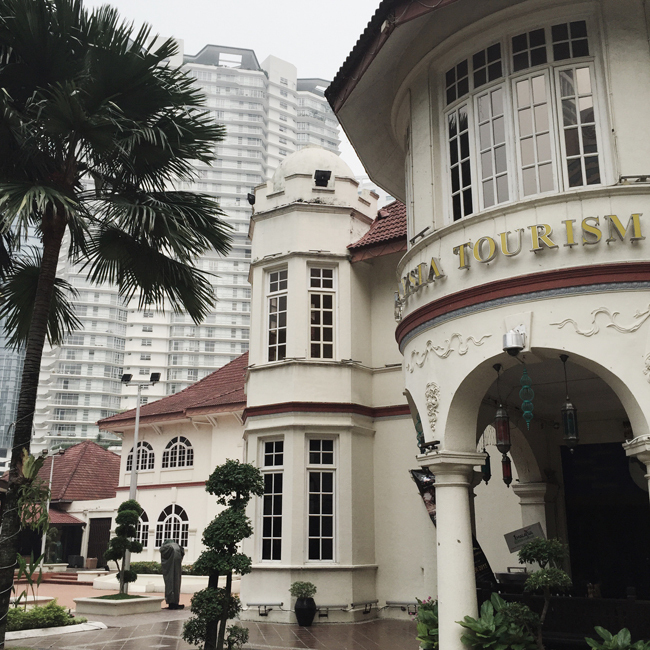 My jaw literally dropped as I hopped off the bus and caught a glimpse of the majestic Dataran Merdeka building. It's massive and beautiful. I am not easily impressed but the vastness of this monumental structure really blew my mind. That was the recurring theme for the entire night. Everything around me felt so new! exotic! and exciting! My senses were tickled in every possible way...from the food, the sights, the production, the conversations...I haven't felt as inspired or stimulated in a long time. Everything was big! bold! beautiful! and bright! 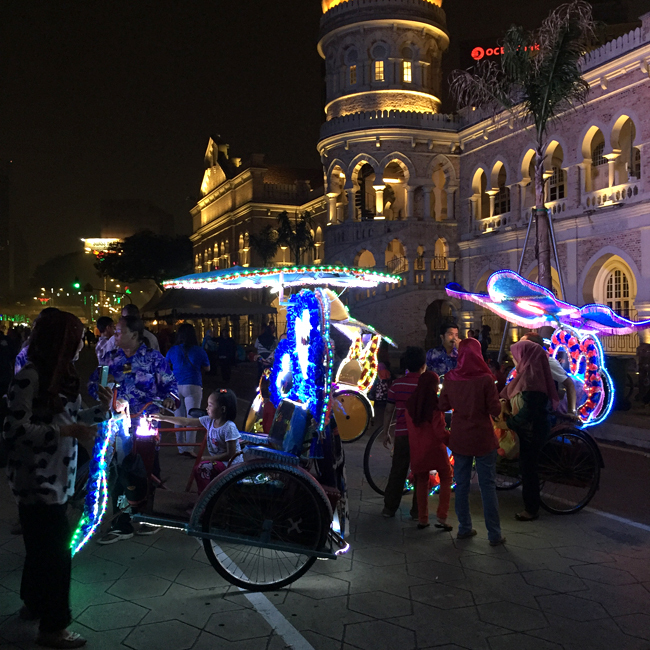 The lighted trishaws running through the crowded streets felt more Cinderella pumpkin carriage than just normal tricycles. The beautiful production and attention to detail of the stage and performances, the positive energy of all the people around you was just electric! The stage was huge! You could tell they spent a lot of money on it. Instead of just a single platform there were actually two large ones positioned back to back. The front was used for the performers while the one at the back was solely for the backdrop to create a stunning 3D effect. 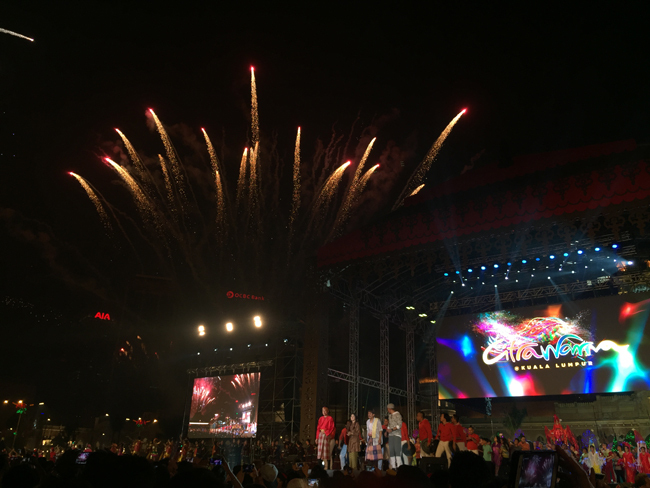 And I guess that's only fitting since CITRAWARNA is touted as a gigantic cultural celebration of lights and sounds with over 600 performers. 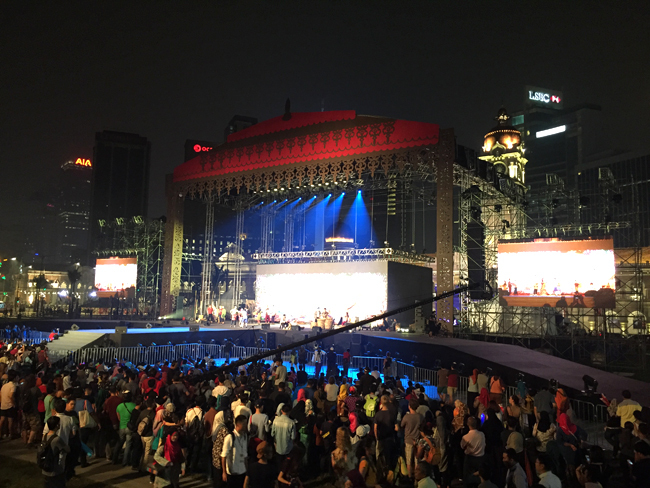 It successfully encapsulated what Malaysia truly is: a vibrant, warm and welcoming city. A melting pot where everyone comes together and triggers the desire to create new experiences. 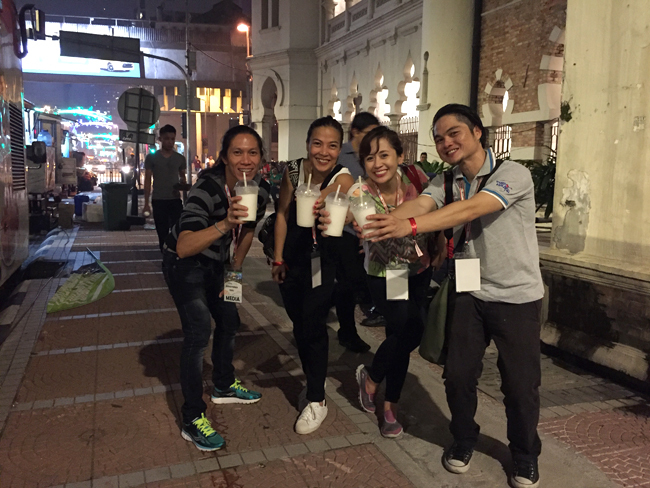 I think my love affair with Malaysia began on this night and it just developed further the more I got to know it. After getting our food and drink fix at the numerous food trucks located on the other side of the square. 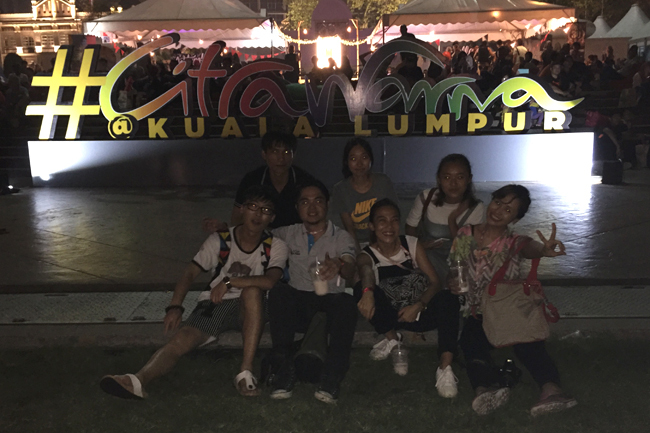 The Citrawarna festival had a unique way of bringing people together and I'm not just talking about our immediate circle. Some random tourists from China asked if they could sit with us and have a photo together. We ended up taking more than a few snaps on each other's cameras. Now, where else does that happen? I wonder what they're doing now actually...and if they have the same thoughts and feelings about this night. The magic continued as we walked through the backstage area and bumped into these performers who were getting ready to go on stage for their performance. 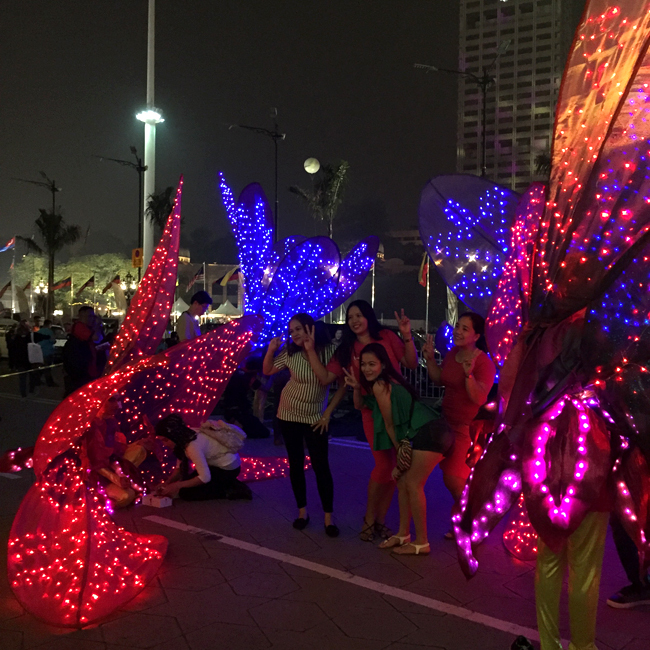 They lit up the area like fireflies and most couldn't resist taking a quick selfie with them. 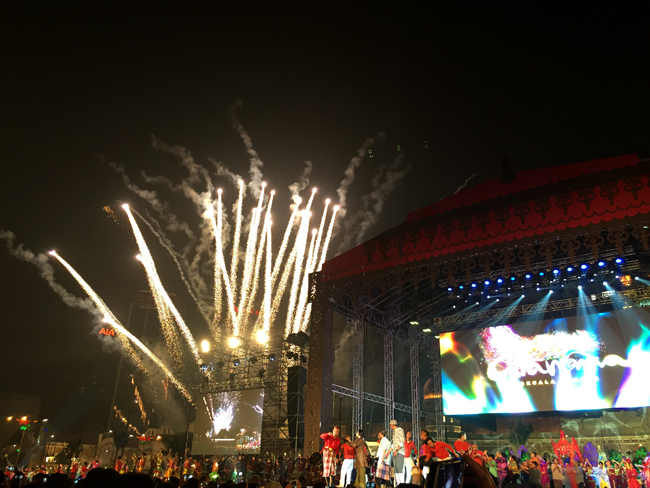 Wrapped up the night with all 600 performers joining the crowd for a final dance while a grand fireworks display lit up the night sky like celestial spotlights shining down on us from the heavens. 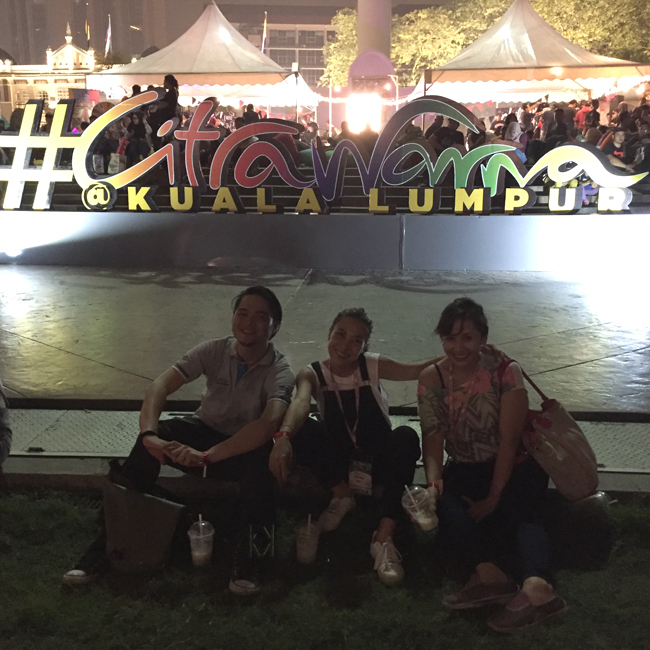 So before I go, let me end this by saying that if you're planning a trip to Kuala Lumpur in 2016, try to catch the next CITRAWARNA (Colors Of Malaysia) FESTIVAL which is scheduled to happen sometime between mid-May to mid-June. You won't regret it. The lights are so amazing! I wish we can have it here in the Philippines! And oh, the Lighted trishaws I wanted to ride them. Wow that looks super amazeballs! Looks like you guys are having a lot of fun! Good luck on your activities tomorrow! Kailangan ko na talagang mag aral mag drive if ever in the future na pahiramin din ako ng car. Baka pauwiin ako bigla haha. 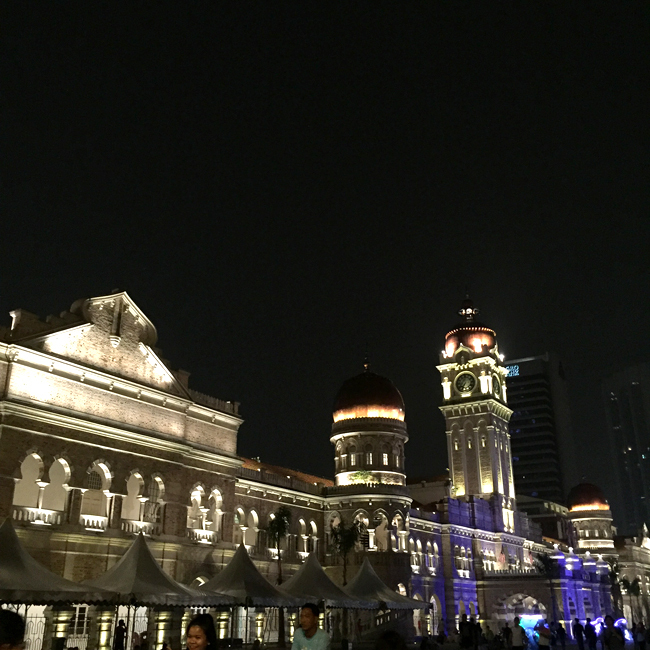 I have been to Malaysia but have not visited the places you have been. I guess it's time to book another trip! beautiful Malaysia! your post makes me want to plan a trip there right away. hehe. wanted to try painting batik too. and.. there's a yay factor about right hand driving for me.. how was it? want to try that too. 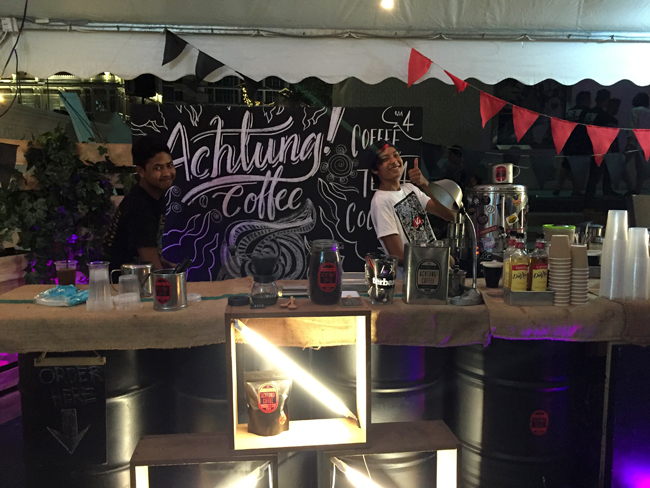 yesss you must go to malacca!